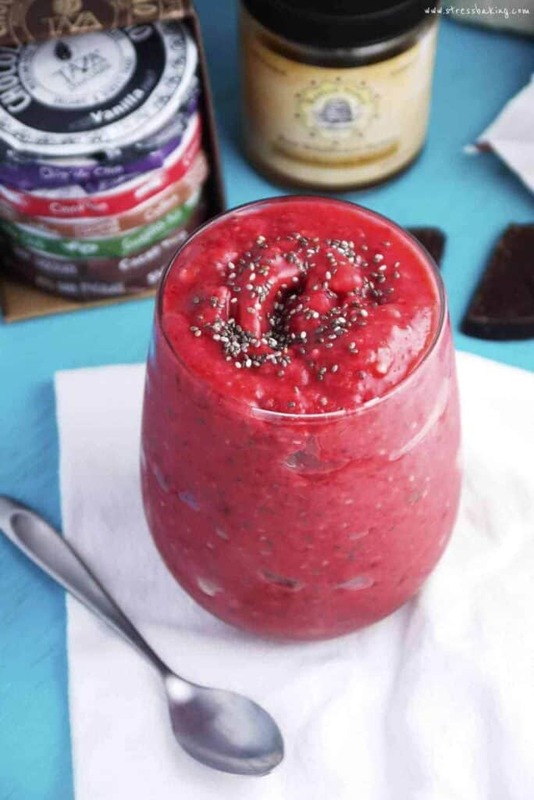 This raspberry mango smoothie has vibrant color and a bold, refreshing flavor! I have been on a serious smoothie kick lately (more recipes to come!) 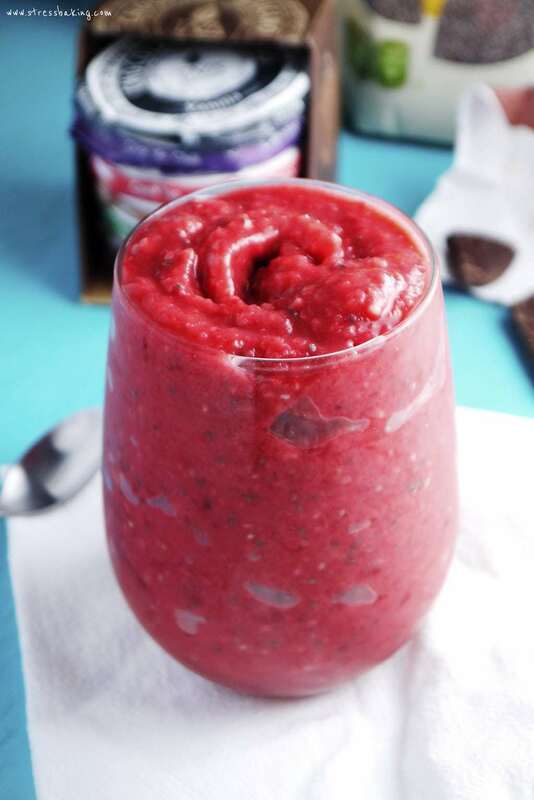 and today’s Raspberry Mango Smoothie recipe is brought to you by a severe craving for raspberries. I’m talkin’, couldn’t think about anything else until I got some raspberries in my belly. 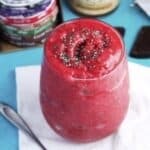 Sadly, it’s technically still winter and raspberries aren’t in season so I have to settle for frozen raspberries – but when it comes to smoothies, that’s not a problem in the least! Since I’m not big on bananas or yogurt, I never add them to my smoothies. My smoothies only ever consist of frozen fruit, chia seeds, and either a non-dairy milk or fruit juice (à la the orange juice in my blueberry smoothie bowl). If I’m using ingredients that have a more bitter nature, like blackberries, I might also add a little honey, agave, or maple syrup. 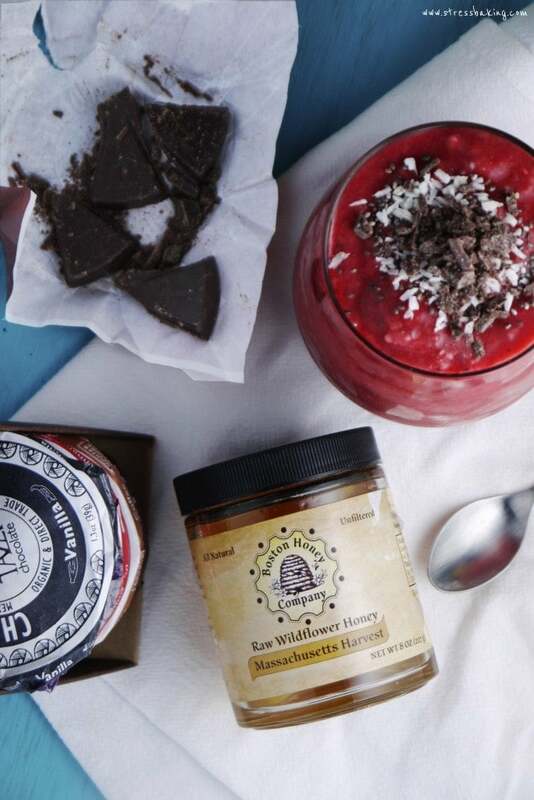 And sometimes I just want a little added sweetness regardless of the ingredients used, so my pot of Boston Honey Company honey comes to the rescue! This time, I needed raspberries. Needed. I had frozen raspberries and frozen mango on hand, so I decided to go a little tropical for my breakfast and use them both along with some coconut milk. And just for fun, I topped it off with some shredded coconut. 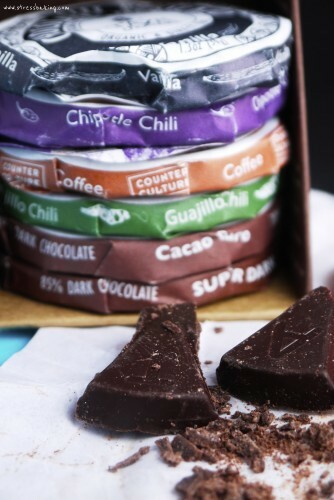 I also really wanted chocolate, and thankfully the boyfriend got me a thoughtful gift of a Taza Chocolate sampler from the Boston Public Market. You HAVE to try their chocolate. It’s stone ground and has a sort of gritty texture with a bold flavor. I’m not even coming close to doing it justice, but it’s the most chocolately-chocolate I’ve ever had. It’s exactly what I think chocolate should be. Just go order some and thank me later. In this particular instance, I went for the Salted Almond chocolate disc. That’s basically almonds which means it’s basically healthy. Right? Right. The discs each have 8 little triangles that easily break apart, so it’s easy to portion. 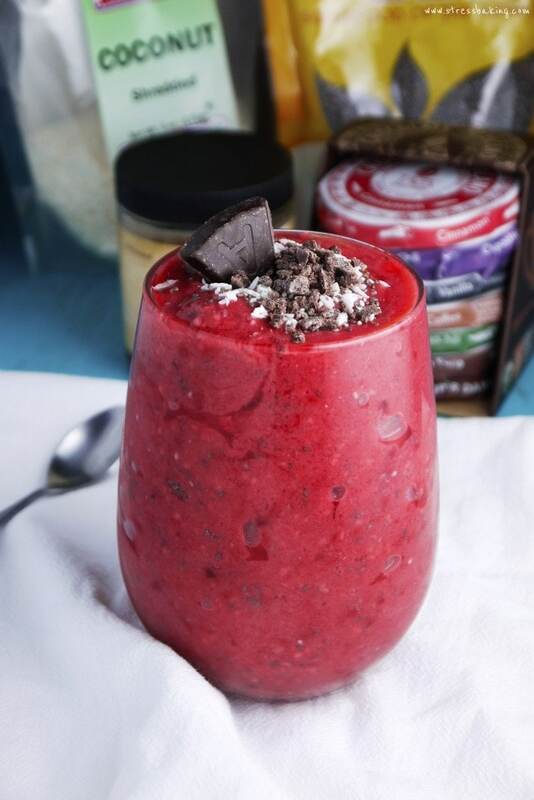 I grabbed a single triangle, chopped it up and threw it on top of my gorgeously red smoothie. And then I decided I wanted a little bit more so I added another triangle – you know, as garnish. I like my smoothies thick enough that I need a spoon, but if you prefer them to be sippable through a straw, just add more non-dairy milk to get it to the consistency of your preference. 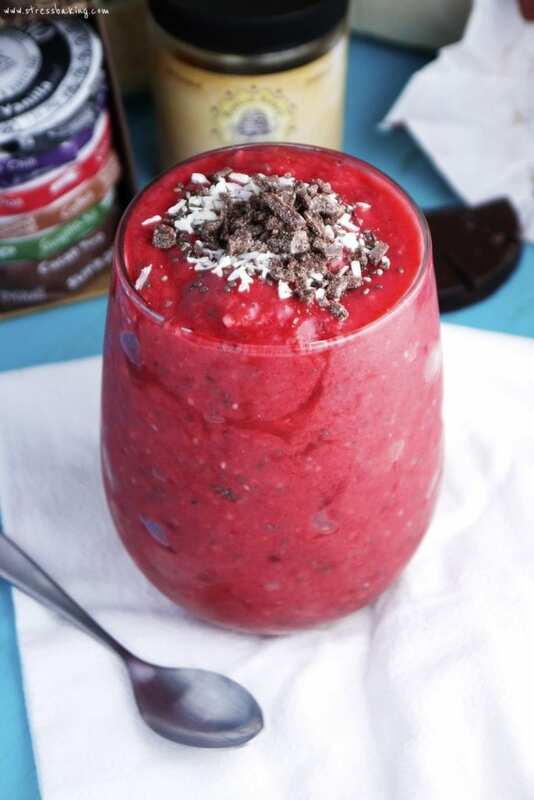 What’s your favorite smoothie topping? Take a picture of one of your own creations and tag #stressbaking on Instagram so I can check it out! 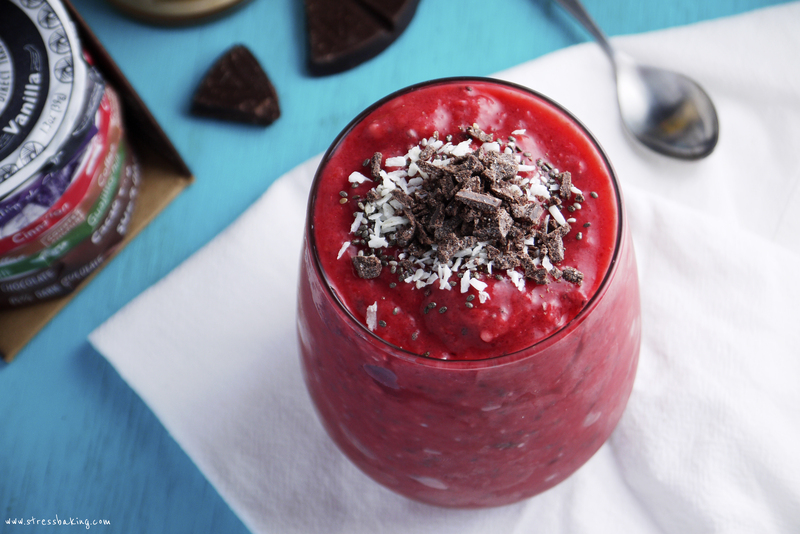 Put all ingredients except chocolate and shredded coconut into a blender or food processor and blend until smooth. If you want it to be thicker or thinner, adjust your amount of non-dairy milk accordingly. 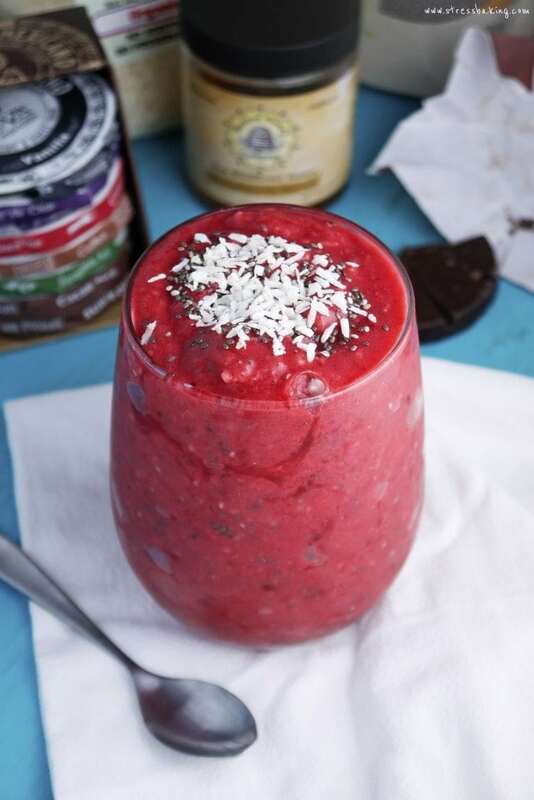 Pour into a glass or bowl, and top with shredded coconut, chopped chocolate, more chia seeds, or any other toppings your little heart desires. Serve immediately and enjoy! never heard of this water, but the smoothie looks delish. Shrimp tacos with fresh mango salsa is one of my absolute favorite summer foods. Thanks for the chance to win this water and give it a try. I can’t wait to try this recipe. Fruit plus coconut plus chocolate is way more appealing to me for breakfast than oatmeal. I like that this is flavorful and not full of added sugar. YUM! This looks amazing!! 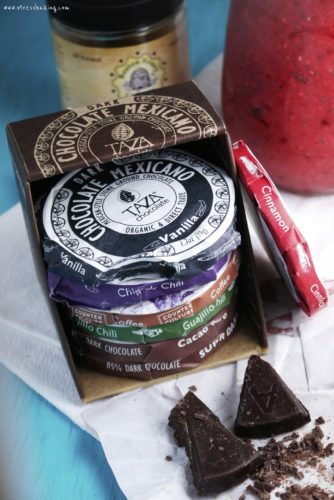 I love chocolate with raspberries but I’ve never thought of just adding some chocolate to a mostly raspberry item. I definitely need to try this, especially with the coconut milk! Right? It’s even better now that the weather is warming up!